The Amaryllis bulb produces spectacular blooms in bright colors. As a result it has become very popular around the world. Amaryllis bulbs are offered for sale online as well as in the local big box stores, especially late fall towards the Christmas Holiday. People love to add some spring color to their homes in the middle of the winter. Amaryllis bulbs originated in the South America Tropics. 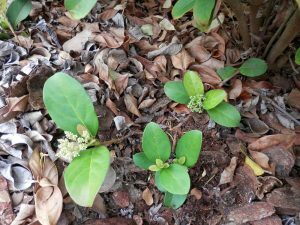 Cultivated indoors or in Florida also outside. There is a variety of shades of White, Red, Pink, Orange & Salmon. Plant bulbs up to 2/3 from the base of bulb in potting mix. Press the soil down firmly to set the bulb in pot. If planting outside, you may plant the bulb up to its neck in the soil. Place in direct light. Ideal temperature: 68-70F to initiate growth. Water sparingly until the bud appears. Two or three buds are common in large bulbs. Water more as the stem grows and leaves appear. To achieve continuous blooms, plant multiple bulbs at intervals of 2 weeks. After flowering, the Amaryllis can be forced to bloom again. Cut the old flowers from the stem. When the stem starts to sag, cut the stem back to the bulb. Do not cut the Leaves! Continue to water & fertilize all summer, 5-6 months, allowing the leaves to fully develop and grow, which in turn develop and replenish the bulb. In early fall, when the leaves begin to yellow, cut the leaves back to 2” from the top of the bulb & remove the bulb from the soil. Clean the Bulb and place it a cool place or in the crisper [40-50F] for a minimum of 6 weeks. DO NOT STORE in the refrigerator that contains APPLES! The gasses emitted by the apple has a bad effect on the bulb. Plant the bulbs 8 weeks before you would like them to bloom. When the Amaryllis bulb grows bigger over time with the right treatment baby bulbs, called bulbils, may develop on the basal plate (root base) of the bulb. This event may become apparent when a leaf appears from under the bulb on the outside of the bulb. After one year the baby bulb should be big enough to be removed from the mother and potted on its own. After two to three years the baby will start flowering. Like any flower an Amaryllis bloom may produce seeds. For seeds to develop the flower needs to be pollinated. The Amaryllis flower in the garden will get visitors in the form of bees, butterflies and other pollinators. 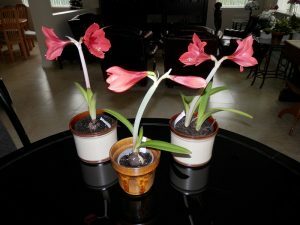 For indoor blooming Amaryllis the owner may act as pollinator. With a Q-tip, or small brush the pollen can be collected from the stamen and applied to the sticky top of the pistil. If successful the small green ball at the base of the flower starts to grow after the bloom wilts and falls off. The seeds grow inside this seed pod. Seeds are harvested when the seed pod dries out and begins to pop open. 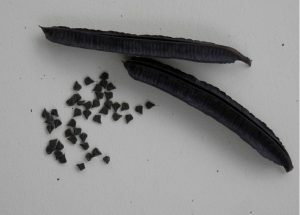 The dark brown seeds are 1/3 inch in diameter, round and flat, razor thin and almost transparent. They can be planted right away. The seeds germinate in 2-3 weeks. The leaves initially look like grass. 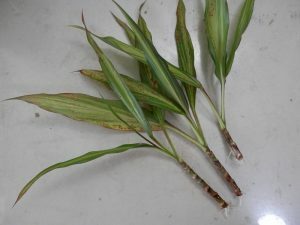 After several months a bulb is seen developing at the base of the leaves. After two years the bulbs are up to two inches in diameter and the first ones may start blooming with a single stem with two flowers. 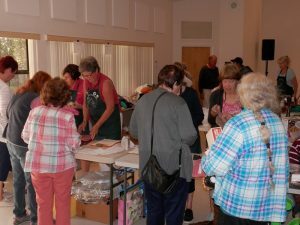 Today March 9th was the Annual “Treasures in the Attic ” sale, organized by the Garden Club at Palm Coast. The sale started at 8am and already at 7 am the shoppers lined up outside the entrance. It looked like a Black Friday event. 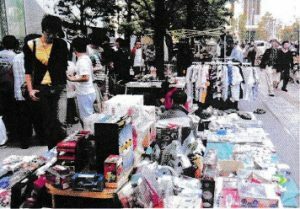 There was a wide variety of merchandise being offered, such as Christmas and other seasonal decorations, books, vinyl records, clothing, furniture and all kinds of household goods. The ladies at the check out were extremely busy. No doubt the revenue is going to be substantial. As soon as the numbers are available, you will see them published here. 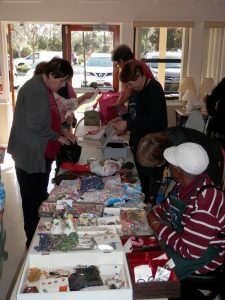 Monday, March 11, 2019, is our next Monthly General Meeting. We are all looking forward to getting back together. Guest Speaker: Podduturu (PM) Reddy, Master Gardener at UF/IFAS Flagler county and a member of our garden club. He will present POLLINATORS NEED HELP. Description: The presentation will include preservation and restoration of pollinator habitats including host plants and nectar plants. The discussion will include Monarch butterflies, Florida Butterflies, bees, wasps, and several other pollinators. Last but not least the management of pesticides and herbicides is of the utmost importance. 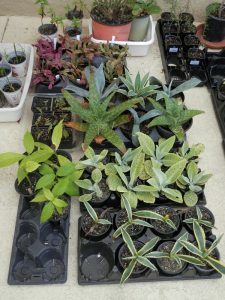 The Propagation Guild members are working hard to produce large numbers of plants for this years plant sale at the Spring Festival 2019. 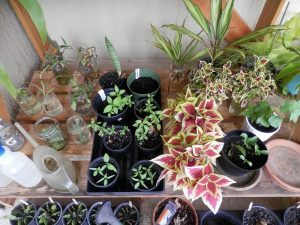 Here is a peek behind the scenes of the propagators plant nurseries. 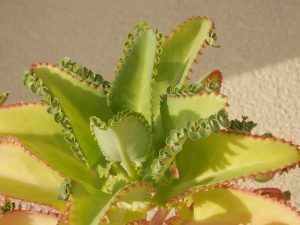 grown from pups of plants, growing at the base, or even on the leaves of the mother plant. underground plant parts cut into smaller sections; rhizomes, bulbs, roots, etc. layering: bending a twig to the ground and securing it there with a staple until it grows new roots. Seeds are planted in soil in pots or in the ground. Pups growing from a mother plant often have roots and can be cut loose and planted in pots. Pups growing on leaves will get roots before or after they fall off the mother plant. In either case they can be planted in soil. Stem cuttings can be put in a jar of water and grow roots and then be planted. 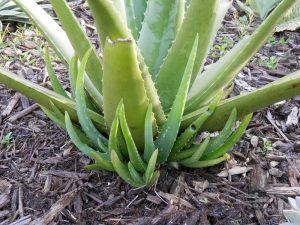 Cuttings can also be planted right away in soil, where they will root with or without growing hormone powder. Like their stem cutting colleagues Leaf cuttings can root in water or in soil. 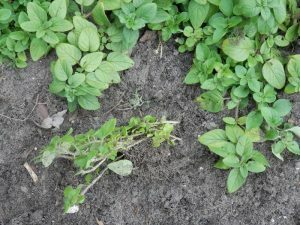 Crawling plants, such as ground covers make roots as they crawl over the earth. 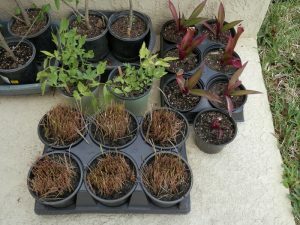 These plant mats, such as grass, can be cut into small patches and potted. 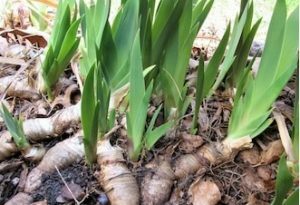 Plants spreading underground via rhizomes (iris, bamboo, ginger) and tubers (dahlia) can be propagated by cutting the underground portion in small pieces. Shrubs with their branches close to the ground can be multiplied by bending and fixing a twig to the ground at which point the twig will develop roots. After a few month the twig can be cut loose before entering in the ground and can be transplanted elsewhere. Glass jars on the left and in the back contain cuttings that grow roots in water. After roots have grown 1 or 2 inches the cuttings are planted in soil. 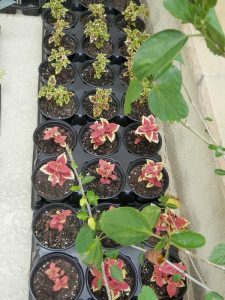 The colorful Coleus cuttings in the center also sit in water where they easily shoot roots. Black pots contain multiple little plants that are grown from seed. 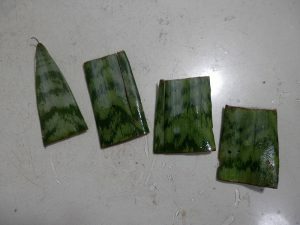 Leaf propagation of Cactus, Kalanchoe and Snake plant. Seeds are planted in medium to large size pots. 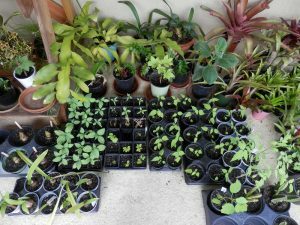 After germination the little plants stay in their birth pot until 2 inches tall. Then they are individually planted in small pots. 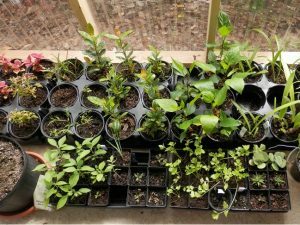 When seedlings or cuttings outgrow their first pot, they are transplanted in larger pots where the root ball and plant can develop further. Until now they have been nurtured in a protective environment, shielded from cold and wind. When they get bigger and stronger, they move to the outside and grow further until ready for the sale. and more…. and then there are even more…. 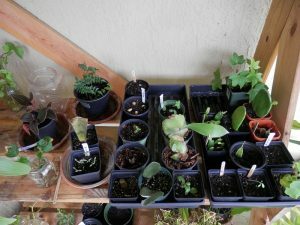 Based on the described techniques and processes many hundreds of plants are being produced by the Propagation Guild members. 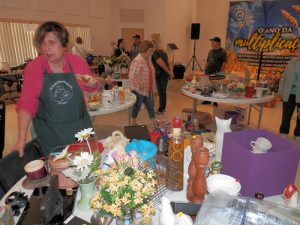 We all look forward to a great harvest and a record revenue for the Garden Club at the Spring Festival on April 13, 2019. 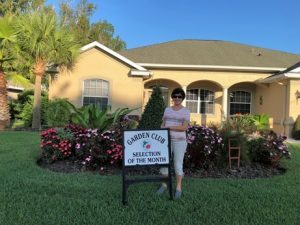 Lauren and Simon Bettencourt of Wood Cedar Dr. have been selected as March 2019 Selection of the Month by the Garden Club at Palm Coast. 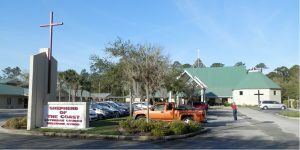 They moved to Palm Coast in 2006 from Rhode Island. Lauren still works but when at home she is diligently working in the yard. The front yard island has a display of red, pink and white Periwinkle, a rich and vibrant two-shaded pink Crinum lily, Firecracker bush, purple Salvias, purple Camellia and a Christmas tree shaped Burford Holly tree. Next to the house you have Queen palm, a fan palm, and pink Periwinkles. To the right of the entry way there is a stone bed area with two Bird of Paradise, a Fan palm, a pink Rose bush, red Amaryllis and a red Mandevilla plant. The back yard welcomes you to an island with yellow Hibiscus, a hanging orange Geranium, pink Periwinkle, with red Daisies among purple Salvias, Buttercups, accompanied with herbs of Rosemary and Basil that all surround a tall Sylvester palm. Along the back fence you have purple Salvias, pink and white Periwinkle and a Butterfly bush. To the right side you have a Majesty Palm that has at the base a red Geranium and a stunning Chandelier Kalanchoe succulent that is truly worthy of its name with bell-shaped clusters of blooms in shades of pink, white and purple. This is the first year it has bloomed and adds much excitement and beauty to the landscape. The patio area has a pink Christmas Cactus, a red Bromeliad along with a large Snake plant and various other potted plants. 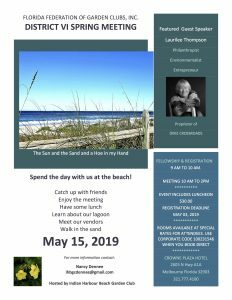 The Garden Club at Palm Coast again organizes a cruise. This one has the Panama Canal as highlight destination. 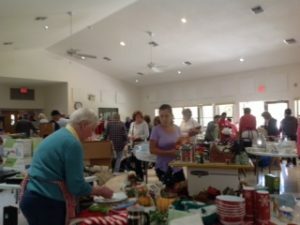 On Saturday, March 9, 2019, 8:00 am – 2:00 pm, The Garden Club at Palm Coast will organize a fundraiser sale at Shepherd of the Coast Lutheran Church, 101 Pine Lakes Pkwy. 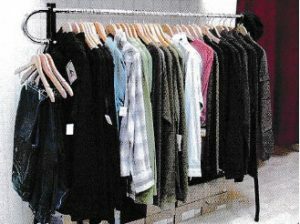 Sale items include: household goods, jewelry, books, gardening supplies, tools and more. 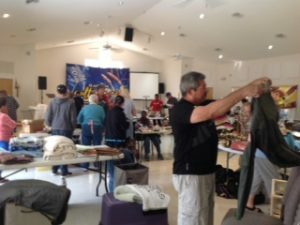 Drop off items for sale at the church on Friday, March 8 from 1 pm – 6 pm. Please NO TV’s, computers and broken items. Gently worn clothes are welcome this year. 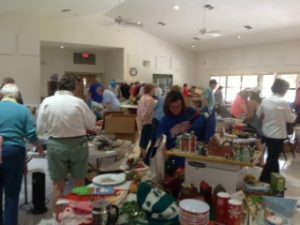 Visit your attic, clean out your closets and bring your forgotten and overstock goods to the Garden Club sale.